How Dangerous is New Covenant Theology? Discussion in 'Covenant Theology' started by pslagle2012, Nov 1, 2017. Although I am Presbyterian, I go to a Baptistic church that leans toward NCT. Some of my best friends are NCT as well. I have been studying it lately and have been concerned by some things about the movement. I have discovered that their understanding of the moral law as progressive rather than unchanging has some scary implications. Some within the movement deny the imputation of Christ's active obedience. I was told by my friend that anger and lust were not sins in the OT. Up until now I have thought of NCT as well within orthodoxy, but lately I am wondering. Does its teachings strike at the gospel itself and/or border on heresy? Is it a teaching I should be concerned about my family being subjected to? It is heresy, get out now, don’t walk run. It's dangerous enough to send a man to hell for a violation of the fourth commandment. It's dangerous enough to cause a little one to stumble and render a teacher worthy of having a millstone hung around his neck and cast into the midst of the sea. Are you implying that people who don't share the Reformed view of the Sabbath are damned to hell? I think our forefathers threw around the word "heresy" far too often. And I think some here occasionally use the language of our forefathers a little too uncritically. If by heresy we simply mean "out of accord with what we believe to be true," then fine, throw the word around. But if we mean by heresy, "teaching that is so aberrant that the true Gospel is lost, and consequently those who teach and believe it are damned," then I think we should be a lot more reserved in using the "H" word. New Covenant Theology gets some things wrong. As lovers of truth and precision, we should reject its errors and mistakes. But to suggest that proponents or adherents of it are going to hell is ridiculous. I'm implying that any sin is enough to damn a man to hell. Anyone who breaks the Sabbath and is not covered by Christ will be damned. Any doctrine that teaches people that they are not obliged to keep the Sabbath is a doctrine that will lead them to hell, if they aren't in Christ. It's not an issue of "sharing the Reformed view" of something; it's an issue of violating the law of God. As the Shorter Catechism says, "Every sin deserveth God's wrath and curse, both in this life, and that which is to come." Do I think that NCT is to be considered damnable heresy, so that its adherents are not to be deemed Christians? No. I was fellowshipping with a Christian brother who adheres to this doctrine just a few weeks ago. Okay, I just wanted clarification. I completely agree with your point. I thought that the only sin that did that to persons are the continual and willful denying that Jesus was the Lord Messiah, as there are 7th day Baptists who claim salvation and worship still on Saturday. To be heresy in a saving sense, one would have to deny the atonement of Jesus for sins, His physical resurrection etc, and NCT does not rise to those levels. They are really wrong on certain aspects of theology, but not teaching outright heresy. ALL though not in Christ are damned, regardless of their Sabbath views. I think our forefathers threw around the word "heresy" far too often. It's because they were deadly serious about the truth. There is a greater issue that Tyler hinted at earlier, and that is that many are misled by their teaching, and it is very dangerous, according to our Lord, to cause His little ones to stumble. I do recognize that all teachers do so in one way or another, for none of us are perfect teachers. But there is a greater condemnation that comes with being a Church guide that is real, and must be dealt with. I was grieved the other week when I heard one of these NCT/Law of Christ guys saying boldly from the pulpit that Christ broke the Sabbath, because it never was a law to be kept. The implications of a statement like that are staggering, and may well rise to the level of heresy. For if that is true, we no longer have a perfect Lamb of God, a Perfect sacrifice, and a Perfect righteousness to be imputed to us. As a teacher of the Word he ought to know better, and those under that teaching are being horribly misled at best, and scandalized at worst. I'm glad to say that not all of these teachers say such things, but this does seem to be a very dangerous trend. Did he argue from the point of view that since Jesus was the Lord over the Sabbath, did not apply to Him, as have heard that before! No, it was more a passing comment in order to communicate that the law (all of it, not just the 4th commandment) is passed away for New Testament Christians. There was very little explanation, which is even more troubling, and apt to confuse, or worse. Interesting that even Jesus Himself, while stating that he came to fulfill all of the Law, did not say that it creased to exist anymore. These are my concerns. The implications of the system may be really dangerous even though those who hold to it don't take it to its logical conclusion. Doesn't an incorrect view of the law affect one's understanding of the gospel? Without a real understanding of the Law, its hard to have a really good grasp on the real Gospel. I think it must be kept in mind that New Covenant theology is not at all monolithic, and is also still developing in several different schools of thought. To push a little further, New Covenant theology, especially as espoused at Southern Seminary, appears to have so far only laid the broad contours of hermeneutics, exegesis, and biblical theology, and has yet to undergo a thorough systematization. For that reason, I think it is a little unhelpful to say, "New Covenant Theology denies active obedience," as that is not true of all branches. I also have hope for New Covenant Theology, the Covenants of Works & Redemption, & the Decalogue. Richard Barcellos especially has been helpful by engaging New Covenant Theology polemically over these very issues. As NCT engages in more thorough systematization, we might hope to see it move to a more Reformed view on these particular issues. The reason why I say that is that there are certain family resemblances broadly speaking between Kingdom through Covenant's exegesis of the Abrahamic, Mosaic, and Davidic Covenants & 17th century confessional Particular Baptist theology, which means there is somewhat of a biblical-theological common core between NCT and a branch of Reformed Covenant Theology. Reading Piper's (DA Carson) view of the Sabbath, I think there is a foundation of common agreement from which a Puritan view could be erected. I see it as an improvement over Dispensationalism, and largely the work of Baptists & Evangelicals working with their hands tied, historical-theologically speaking. And yet, they are coming to a more biblical path, in large part due to reflection on the content of Scripture & how that should effect hermeneutics. I am a little concerned about antinomianism tendencies because of a lack of good systematic theology, and shallow popularizations. But to be honest, I've seen a few Reformed churches that had loads of systematic theology & correct views of the Sabbath, etc., but did not practically teach the necessity of love, and thus were quite contrary to the rule of Christ (Rom. 13:8ff). Whereas I have known many believers quite errant in their dogmatics who nonetheless understood the necessity of love. Color me naive, optimistic, and gullible. Why do you think a theology that is new is a good thing? Has the church been without a corrective theology for almost 2000 years? How do you know that there is not an even newer theology that will supplant New covenant theology? How long do you think it will take for new covenant theology to finally be codified? I personally don’t believe this will ever happen. What if it is finally codified and it lacks historical support? 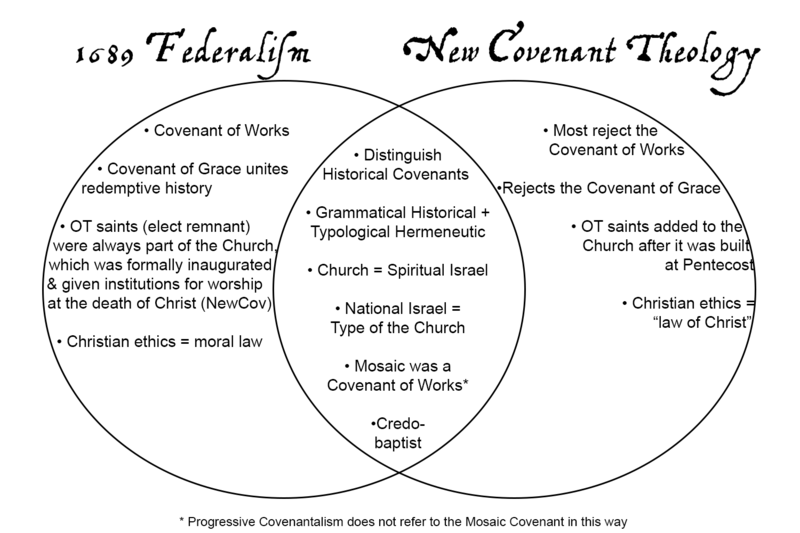 There seems to be now among Reformed Baptists an attempt to re discover Covenant theology viewpoints from a Baptist perspective, and will be interesting to see just how the NCT and 1689 Confession holders manage to work this all out in the Systematic theology aspect. I think that the Lord can give to us fresh and new insights into theology through gifted men, correct? Dear Bill, since you are so sure that New Covenant Theology is entirely a theological novelty without precedent in church history, could you articulate what is so new about it? I'm 23, so I have a lot of experience with these sort of things. I guess 50 years. NCT is as a whole a new system, you or I would be hard pressed to site three systematic Theology books that teach it. However, Antinomianism, dispensationalism, anti-covenantalism, anti-paedobaptism and a host of others errors are not new. BTW you were the one to first point out the novelty of the system. Historically it lacks support neither the writers of the first or second LBCF taught anything like it, especially Dispensational stuff which did not exist until the 1930s. Can you name any reformers or puritans or pilgrims who taught it, as it currently exists? Bill, just to be clear, I didn't assert that New Covenant theology is a novelty, I said it is developing. Evangelicals have spent the last 70 years developing a doctrine of inerrancy, but it isn't a novelty in the sense that you make it to be. Augustine made a pretty big deal about reading Scripture with a consistent typological hermeneutic, and I consider that to be the central thesis of New Covenant Theology. So I guess it isn't that novel. John Owen, confessional Particular Baptists, Jonathan Edwards, John Erskine, Charles Hodge, Keith M Watkins, James Buchanan, and Luther are all capable of discerning a typological relationship between Israel and the church, so I would not consider that a novelty, though New Covenant Theology is still systematizing the results and working out the particulars in its own distinctive way. Craig, none of the people you listed would claim a theology anywhere close to NCT. NCT is a novelty that is not confessional. NCT is also very dangerous. I have several friends who ventured into it and not one of them attend church today, although they all still claim to be Christian (go figure). Thanks for the discussion. They are attempting to clarify and state down the NCT theology in a systematic fashion now, for did not Calvinism itself get worked out over a period of time? or any other theology in the Church, for few came straight out fully codified did they? I just do not see them rising to the level of being heretics with this theology, but would also add in some areas it is really bad and wrong. I am not sure what you are advocating here. Are you hoping for some rehabilitation of NCT because you see merits? Why is it that you have an interest in this movement given the fully-fleshed out LBCF that you affirm? Please do not equate Reformed historical development on a par with NCT. I was not attempting to do that, as my only real thought on it was that they seem to be in the early stages still of putting together what all who hold to NCT would see as being their common agreement points in their theology. They have yet to prodice any ST, as far as I know.